Surprisingly many people are not sure who to list on their contacts in case of an emergency. In fact it seems this question only seems to come up when a person is asked to fill out the form at work. When you are a manager or owner of a business you want to have contact information for all of your employees and have them keep it updated each year. Hopefully there is never a cause to use it, but unfortunately accidents do happen and you will want to notify their loved ones in case something does happen. This contact list can be kept in their file or in a separate file for all your employees. If you are not sure what to list in a contact list we can help with our contact list template. 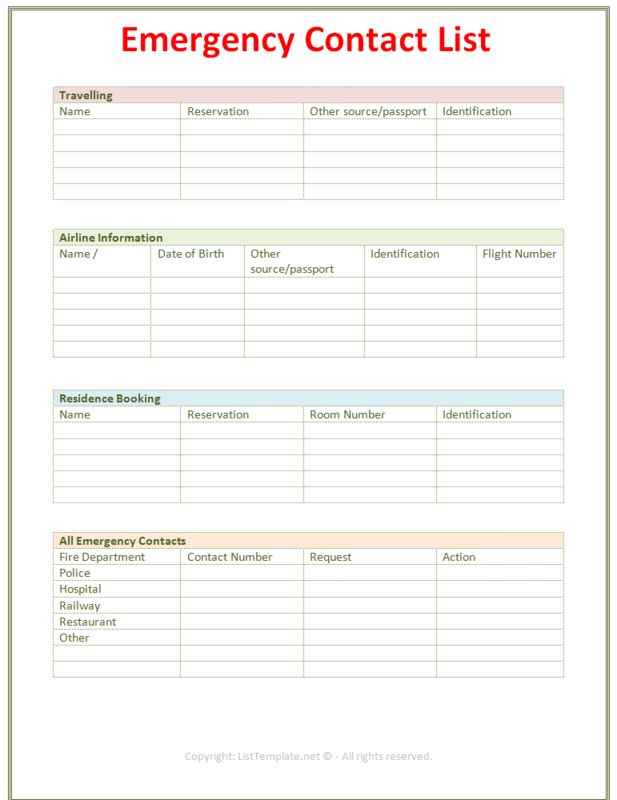 This easy to use contact list template is made in Microsoft Word and is easy to use. You can simply print it out the way it is and have your employees fill out the blanks. Or you can edit the file and make the changes you feel will work the best for your business. There is even a spot at the bottom for all important phone numbers such as fire department and police department. If they happen to be traveling this is a good form to have on hand so all relevant travel information is included in the contact list as well. This can save you time when trying to track your employee or loved one, in case there is an emergency. Never again will you have to worry when you have everything filled out and ready to go. You can even go back and type everything in for your employees or yourself and then hit print. This gives you a professional looking copy that is easy to read for your records.